We are use to email addresses @gmail.com, @yahoo.com, @outlook.com and so on. Email IDs on these services look professional with solid email infrastructure back end. Problem is, majority of email IDs with common name and words are not available on these services. In this case, one has to settle with long and lengthy email ID. If you are ready to try alternatives, then register shortest and smallest possible email address for personal use. 1. Dr.com email ID from Mail.com is possibly shortest (quality!) email ID service provider. Since Dr is short form for doctor – people in medical professional will love to have free email ID @dr.com (like mycoolname@dr.com). 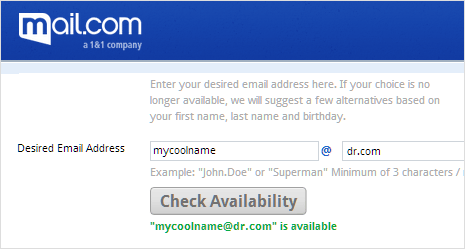 Even common users will love to have @dr.com ID for that extra professional touch. 2. In.com email ID from network 18 group in India also offer shortest email IDs. You can get email ID like mycoolname@in.com from this service. As such in stands for India but anyone from any country can register ID @in.com (in does have literary meaning as “in”side). 3. K.st email ID takes shortest ID to another level. You can grab very short email ID like mycoolname@k.st from this email service provider. Unlike other providers like dr.com and in.com – this short ID k.st is little difficult to remember or recall. Do they provide good and robust email service – While registering shortest email ID is easy but do they provide email service that matches to likes of Gmail and Yahoo. Well, dr.com from Mail.com and In.com do provide good email service – try them for sure. Does any one have idea to configure in.com email into outlook or eudora? Hey I have used in.com email id but the main problem is that there is no guidence to configure it on outlook express. Does any one have idea to configure in.com email into outlook?